There's no two ways about it: Venice has one of the most confusing, frustrating, and unfathomable layouts of any city on Earth. On the surface, it looks simple enough: a few big islands wrapped around the sweeping backward-S curve of the breathtaking, palace-lined Canale Grande (Grand Canal), with lots of smaller canals—nearly 180 of them—worming their way through those islands across a tangle of alleys. The Venice we all know and dream about lies 2.5 miles from dry land, connected to the mainland sister city of Venezia-Mestre by the Ponte della Libertà, which leads to Piazzale Roma—the only bit of Venice accessible by car. 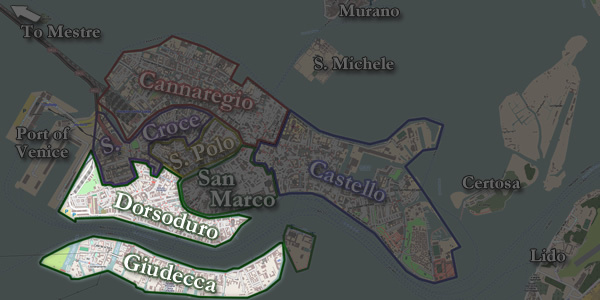 Venice's chaotic map is divided into six main neighborhoods called sestieri, or "sixths"—which doesn't include the some 168 outlying islands (but we'll only worry about three or four of those; see below). 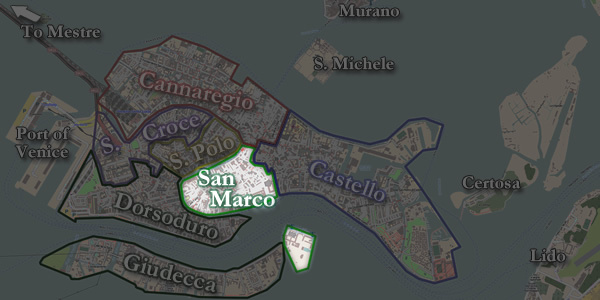 The center of Venice is the San Marco district, much of which is very touristy today. Here you'll find the gorgeous, pigeon-filed and café-lined Piazza San Marco (St. Mark's Square), with its Cathedral of St. Mark and Palazzo Ducale (Doge's Palace). The extension of Piazza San Marco that runs along the Palazzo Ducale to the Grand Canal is called Piazzetta San Marco. The San Marco district is home to hundreds of souvenir shops, the priciest hotels, the world-renowned (and recently burned down, but now rebuilt) La Fenice opera house, and many (generally expensive) restaurants. East of San Marco lies the large Castello neighborhood, which features a classy stretch of lagoon-front property called Riva degli Schiavoni (it starts where Piazzetta San Marco hits the Grand Canal's mouth in the Bacino San Marco basin), home to a plethora of upscale hotels including the famous Hotel Danieli. Castello is also home to a number of less expensive hotels and, since Castello basically starts right out the back doors of the Basilica of St. Mark's and the Doge's Palace, can make for an excelelnt home-base in Venice: Removed from the bustle of San Marco yet still close to major sights. 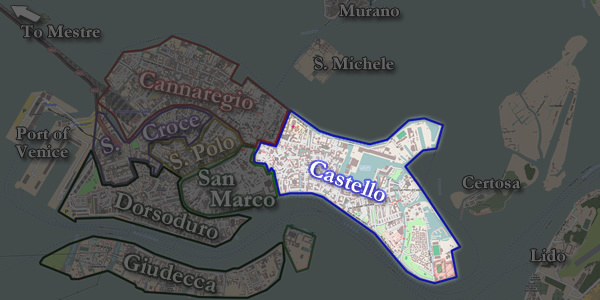 Castello is focused upon the Arsenale, the old ship-building sector of the city—still a navy yard, and hence mostly closed to the public (except every other year during the internationally renowned art show known as the Venice Biennale). 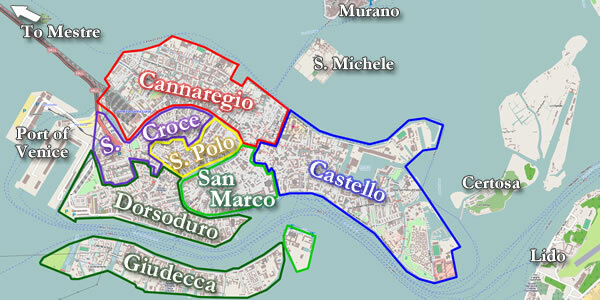 Across the Grand Canal from San Marco is the most southerly of districts, the Dorsoduro. Dorsoduro is the trendiest quarter in a city that, despite its reputation for a Carnival to rival Rio's, doesn't seem to have heard of nightlife. The area is sparsely populated and has a smattering of bars and cafes, some good trattorie and cheap hotels, and Venice's two great art museums, the Accademia and the Peggy Guggenheim. Unconnected to the Dorsoduro—but technically a part of it and visible from downtown Venice—is the Giudecca, a long curving island paralleling Dorsoduro to the south and accessible only by boat. It's a tranquil working-class place, mostly a residential neighborhood but also home to the official youth hostel (don't bother; the Foresteria Valdese is far superior and more central) and a handful of hotels (including the fabled Cipriani, one of Europe's finest). Unless you arrive by plane, chances are that the first neighborhood you'll see—whether taking the train or driving in—is the Cannaregio, on the very north end of the city above the top curve of the Grand Canal's backward "S". 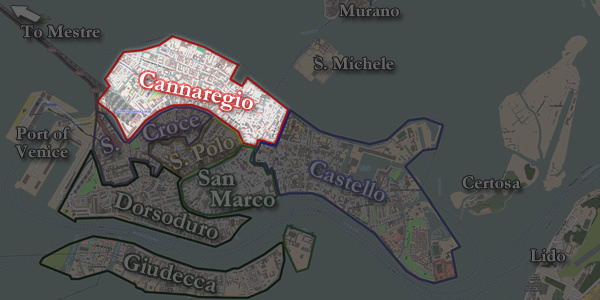 Cannaregio also has the dubious honor of incorporating Europe's first Jewish Ghetto. There is, as usual, cheap lodging right around the train station, but it's mainly a residential neighborhood and unless you're coming up here to see specific sights, you probably won't hang around too long. S. Polo (frequently, though incorrectly, written as "San Paolo"—which is understandable, as that's the standard Italian spelling) fills up much of the area on the west side of the Grand Canal, a commercial district with lots of moderately priced hotels, shops, and trattorie, as well as some big ol' churches and their outbuildings that beckon the sightseer, like the exquisite Scuola Grande di San Rocco. To the north of S. Polo, lying along the underside of the top curve in that backwards "S," is the sestiere of Santa Croce, tiniest of the neighborhoods, half industrial and half filled with sleepy old palazzi along the Grand Canal, all very untouristed. In the lagoon north of central Venice lie a number of islands, the three most interesting being Murano, Burano, and Torcello—all easily accessible by public transport vaporetto. Along the way, you pass the Isola di San Michele, Venice's cemetery island where such celebrities as Stravinsky and Diaghilev are buried. The vaporetto also stops at the sleepy residential island of Mazzorbo across from Burano. There are several long barrier islands separating the lagoon from the Adriatic Sea and accessible by car. The most famous by far is the seven-mile-long sliver of faded-glory beach resort known as Lido di Venezia, the city's sandy beach and a popular summer destination for its concentration of seasonal hotels (also: the locale for the famous short story A Death in Venice). It is actually rather dull (when compared to "downtown" Venice itself), basically a small Italian beach-resort town strung out in a long line consisting of creaky old (and some new) grand hotels. Just north of the Lido is the barrier peninsula called Cavallino-Treporti after the town very near its southern end. It's actual southern end, just a short ferry ride across from Venice itself, is called Punta Sabbioni. I point all of this out since the long, wide, sandy beaches at this end of the peninsula are where most of the campgrounds for Venice are located. Buildings are numbered—not based on location, as in most places (1, 3, 5 on one side of the block; 2, 4, 6 on the other)—but rather on the order in which the buildings were built (so no.1 might be next to no. 2074 and across from no. 116). Street names can be repeated from neighborhood to neighborhood. So you may find "Calle della Madonna" and think you're home free—only it's the Calle della Madonna in San Marco and what you wanted was the Calle della Madonna in S. Polo, half-way across town. To help, this site will present addresses in a far more logical manner than the official one: including both the number and the street name, followed by the sestiere (neighborhood) designation in parentheses (the way anyone but a Venetian would expect to read them). We'll also try to include cross-streets, a nearby campo (square), and other details to help you pinpoint an address. What's more, we've teamed with Google maps to plot the location of every hotel, restaurant, sight, and major landmark detailed in this online guide. Most pages on this site will include, near the top of the the sidebar on the right, a tiny inset map showing the location of the address being mentioned. Click on the "View Larger Map" to be taken to the ReidsItaly.com Google map version of this Venice guide, peppered with little icons denoting sights (blue flags), hotels (red beds), and dining spots (yellow knife-and-fork images), as well as tourist info offices, train stations, major vaporetto stops, and other useful info. The best advice I can give is this: Buy the best map you can find, take a deep breath, and prepare to get lost repeatedly. 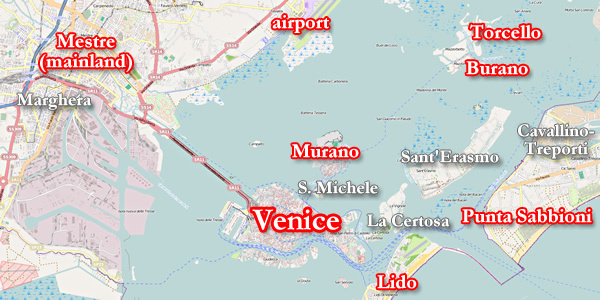 If you have inernet access, you can locate any address in Venice using this awesome online map: maps.venicexplorer.net. 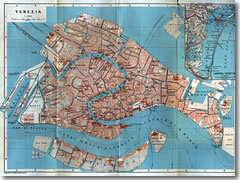 The Venetian map is a big tangled bowl of spaghetti. Venice has two overlapping infrastructures, one of narrow streets and the other of canals. These networks sometimes work together, and sometimes interfere with each other. The impossibly twisty, narrow alleyways of the city often end abruptly in a blank wall, or run you in circles, or suddenly turn into steps that disappear into a canal. Constant backtracking is inevitable. Occasionally, the alleyways will get you from one place to another, or spill unexpectedly into a large campo (square), or lead over one of the thousands of tiny arched marble bridges straddling the canals—the most magnificent is the Rialto bridge over the Grand Canal—and dump you into another crazy tangle of streets on the other side. Little yellow signs (sometimes they're white) are scattered along the main routes with arrows to help lead you from one major landmark to another—San Marco, Rialto (the main bridge), Ferrovia (train station), the Accademia museum—and the sharp-eyed can follow these along the convoluted path all the way from, say, the train station to Piazza San Marco (in about 45 minutes). Plan on any journey taking three times as long as you imagine, and don't fret about being late. Setting out from your hotel door in Venice is always an adventure—as long as you treat it as such, you'll have fun getting lost. 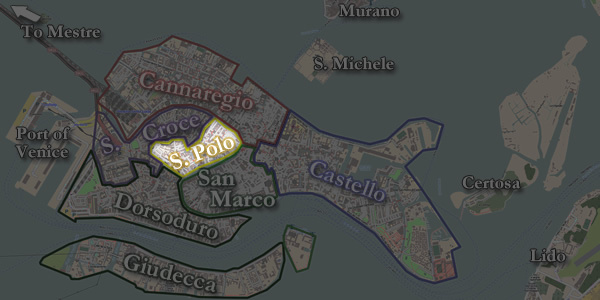 Again, you can locate any address in Venice using this awesome online map: maps.venicexplorer.net. Venice doesn't use the same labels for its streets and squares as the rest of Italy. A canale or rio is a canal, of which Venice has nearly 180. Streets might variously be called calle or ruga. A ramo is a side street (it means "branch"). Fondamenta or riva both denote a sidewalk along the edge of a canal (usually they take the name of the canal itself, though not always). A rio terrà is a street made from a filled-in canal. 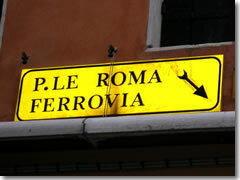 There are also sottoportico and sottoportego—a public passageway under a building. A campo, campiello, or corte is a square. In fact, Venice only has three squares named using a variant of the tyical Italian word "piazza": Piazza San Marco, Piazzetta San Marco (the little "L" extension of Piazza San Marco running along the north flank of the cathedral), and Piazzale Roma. A piscina is a square that, like a rio terrà, was once a canal or basin of water and has since been filled in.